Back in 1997 Macanudo cultivated a small crop to grow a dark exquisite Connecticut Broadleaf wrapper. From this effort, the Macanudo Vintage 1997 collection was born. A perfect hand-rolled premium cigar that looks just as elegant as it tastes. This handmade cigar is bold with careful blends of Dominican and Mexican long-fillers locked-up in a hearty Honduran binder. What’s striking about this stylish premium cigar is the wrapper. Draped in dark, silky Connecticut Broadleaf, this gem has the feel and look that is smooth and seamless. Light one up and you’ll instantly taste the natural maduro sweetness accompanied with notes of dark roasted coffee, cream, and cedar. 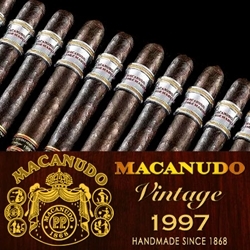 Smokers Discounts can brings these Macanudo Vintage 1997 cigars right to your doorstep. We’ve made it easy and affordable to buy premium cigars online. A variety of sizes and flavors are listed below. Each of these styles are in stock and available for a discount price! Call us for more details!